As spending on autonomous vehicles and driverless technology accelerates, here's one stock that looks like a no-brainer to own, and one that looks tempting, but with a few caveats. As an avid follower of and investor in the automotive industry, one thing has become abundantly clear to me over the past couple of years: Driverless cars are coming. Those autonomous vehicles might not arrive as quickly as the old sci-fi movies predicted, but with an increasing number of Silicon Valley's finest plunging into creating the technology, they're well on the way to becoming a reality. The long-term development of autonomous vehicles offers savvy investors an incredible opportunity to invest in the companies that will change the future of the automotive industry -- but where to start? NEXT-GENERATION FUSION HYBRID AUTONOMOUS DEVELOPMENT VEHICLE. Image source: Ford Motor Company. One company poised to benefit from the advent of driverless cars that many investors overlook is STMicroelectronics (NYSE:STM). It's the largest chipmaker in Europe, has a broad product portfolio within the global semiconductor industry, and boasted nearly $7 billion in 2016 revenue. It has especially promising prospects in microcontrollers, sensors and automotive products. But it's the automotive segment that has some investors drooling at its potential. Though the company has obvious potential, it also has a slightly more complex corporate structure than investors are used to with U.S. based companies. That's because roughly 27% of STMicroelectronics is owned by a group of companies controlled by the French and Italian governments; it gives the French government veto power in any board decision, and gives both governments a large presence in the boardroom. While that's not a deal-breaker when it comes to buying the stock, it's a red flag that emphasizes other entities' interests could be placed above those of ordinary shareholders. Another small red flag is that despite being Europe's largest chipmaker, it has failed to generate a scale advantage, and its gross margins and operating profits are below those of many of its competitors. 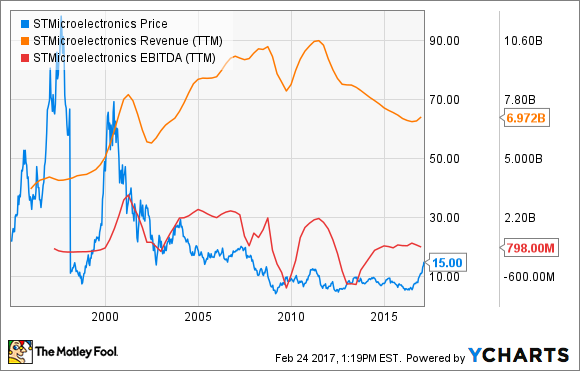 Further, as you can see below, the company has failed to gain any consistent upward movement with its top-line sales or bottom-line profits. STMicroelectronics looks to have too many red flags, but this next company looks like a strong play ahead of the driverless technology trend. Mobileye N.V. (NASDAQOTH:MBBYF) was far ahead of its time when it launched in 1999 with the idea that machine-vision technology that enabled safer traveling was a good business to be in. Its founders were right, and 17 years later the company finds itself at the forefront of the driverless-vehicle revolution. If you're unfamiliar with the company, Mobileye is now the leading supplier of software that enables Advanced Driver Assist Systems (ADAS), and already boasts more than 25 partnerships with major automakers. Proof that Mobileye's business is performing well can be found in its recent fiscal year highlights. Its revenue topped $358 million, which was a staggering 45.6% gain over the prior year, and adjusted earnings-per-share reached $0.22 -- both figures beat Wall Street estimates. Beyond its financial victories, the company also extended its ADAS leadership with 12 program wins across 11 separate automakers. It seems like every week we're hearing about a new development from the company. Just last week, BMW Group and Mobileye announced an agreement to introduce the latter's Road Experience Management (REM) data-generation technology to new BMW models in 2018 -- basically, its a way to crowdsource a new kind of sensor data using BMW vehicles. Partnerships like that will become critical for Mobileye's efforts to maintain high-definition maps at minimal cost, and secure its leading position in a driverless future. Also tantalizing are Mobileye's adjusted-EBITDA margins, which are sky-high thanks to its low fixed cost base and less intensive marketing and SG&A costs. For 2016, its adjusted-EBITDA margin hit 48.3%, which is simply outrageous compared to just about any company, much less those within the historically capital intensive automotive industry. 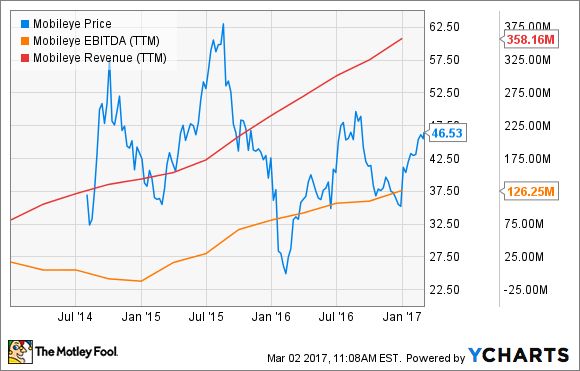 Investors shouldn't be surprised if Mobileye posts a double digit compound annual revenue growth rate over the next decade, and that's not just my opinion. "We believe the continued acceleration in [advanced driver assist systems] take rates and investment in autonomous capabilities will drive strong top­line and earnings growth for the company over the next few years," wrote Richard Kwas, an analyst at Wells Fargo, in a note to investors, according to Automotive News. If this company continues to create new partnerships and execute on its driverless technology, it could be a great stock to ride into our autonomous-vehicle future.